A college professor who sustained a brain injury during a rear-end crash was recently awarded $900,000.00 by a Cook County jury. On March 26, 2015, William Pierros was driving eastbound on the Eisenhower Expressway, at or near the Mannheim Road exit in Hillside, IL. While Pierros came to a stop along with other traffic, Jason Sitaras, who was traveling behind him, did not. By his own admission in a deposition, Sitaras was looking down at his GPS at the time of the incident and did not realize that traffic had stopped. As a result, his vehicle collided with Pierros’ at approximately 15 to 20 miles per hour in a rear-end crash. Pierros, who is a professor at Concordia University Chicago in River Forest, sustained a concussion and chronic brain injury as a result of the high-speed rear-end crash, leading to serious short-term and long-term problems. Immediately following the collision, Pierros complained of constant headaches, nausea, and memory impairment. While his condition improved over time, the rear-end crash reportedly left Pierros with recurring headaches and a “significant deficit” in his ability to store new information. Pierros’ personal injury attorney argued that his work as a college professor has suffered as a result of his brain injury. He reportedly has difficulty grading students’ work and giving feedback, often having to re-read assignments multiple times in order to remember what he has read. “He’s essentially become extremely forgetful,” said Pierros’ attorney. On January 16, 2019, following a weeklong trial before Circuit Judge Thomas V. Lyons II during which defense attorneys contested the permanency of his brain injury, the jury awarded a verdict of $900,000.00 to Pierros. Automobile accidents are sadly an everyday occurrence, at a rate of more than two million each year in the United States, including over 35,000 fatalities in 2015 alone. One of the most common types of auto accidents is the rear-end crash, in which one vehicle stops or slows down and the vehicle behind it does not. According to the National Highway Transportation Safety Administration, rear-end crashes occur an average of once every eight seconds and account for 28 percent of all automobile accidents in the United States. The fact that rear-end crashes are so commonplace does not mean that they are not dangerous. In addition to brain trauma, victims of rear-end collisions can suffer a wide range of injuries, including whiplash, cuts, broken bones, amputation of limbs, paralysis, and even death. The most common cause of rear-end crashes is following too closely, or “tailgating.” All drivers have a duty to remain a safe distance behind the vehicles ahead of them so they can slow down or stop in keeping with the vehicles ahead of them. Failure to do so is a violation of Illinois law, specifically Illinois Vehicle Code Section 11-710, which makes the “tailgating” drivers legally responsible for all property damage and injuries that result. • Exceeding the legal speed limit. • Driving too fast for road or weather conditions. • Driving under the influence of drugs and/or alcohol. • “Distracted” driving, including texting, adjusting your radio, reaching for food – basically, looking anywhere but the road ahead of you. Typically, the driver who rear-ends the vehicle in front of him or her is determined to be at fault, but that does not necessarily prevent that driver’s insurance company from arguing the opposite – namely, that you were at fault, that you stopped or slowed down too quickly, so that the driver who struck you had no chance to stop in time. 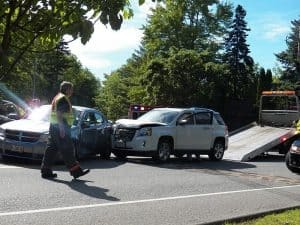 For this reason, to help protect you and your rights when you have been the victim of a rear-end crash, consider seeking out the assistance of a knowledgeable and experienced attorney, such as the Illinois rear-end crash attorneys at GWC Law. GWC is one of the premier Personal Injury and Workers’ Compensation law firms in Illinois, with over $2 billion recovered for our clients and offices throughout the state. If you have been injured in a rear-end crash, please contact GWC to schedule free, no-obligation consultation with an attorney. Call our office at (312) 999-9999 or click here to chat with one of our representatives at any time.